CPR in Television – Which Shows Did It Right and Which Need CPR Training - First Edition First Aid Training Inc.
With the accessibility of Netflix, Hulu, and many other online streaming services, bingeing a television show has become the norm. It is now socially acceptable to sit in front of our televisions soaking in all that Hollywood has to offer for hours on end. Television has come a long way over the years and television shows now touch on some pretty serious and realistic scenes. But the question becomes, do they get it all right? In particular, are they doing CPR correctly or do they need a bit more CPR training? We know that Hollywood tends to get the use of AEDs wrong, but what about CPR? 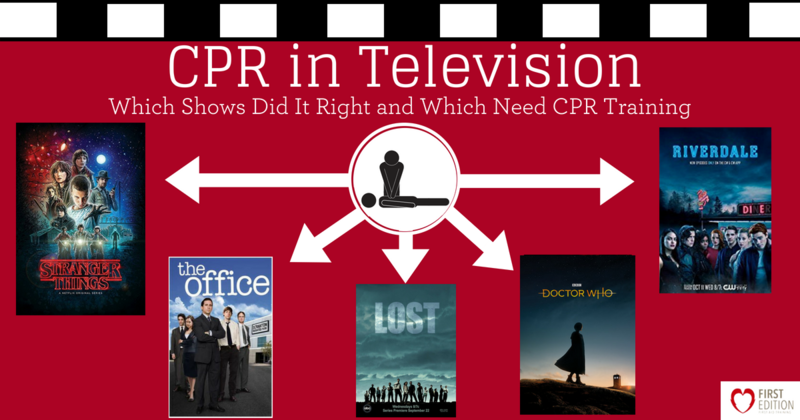 Check out these television shows and learn which ones did it right and which ones need to update their First Aid CPR certifications! Joyce and Hopper have finally found Will after what seems like ages of searching. They find Will in the upside-down attached to some sort of alien plant. They remove the plant from Will’s throat and Hopper begins CPR on the unconscious Will. As he begins giving compressions Hopper gives a frantic Joyce instructions – he tells her to give Will two breaths after he finishes the compressions. The scene shows a flashback of Hopper and his wife watching as doctors give CPR to his now deceased daughter, and the fear of losing someone else can be seen on his face. The memories start to overwhelm Hopper and he begins to use hefty blows to Will’s chest. This moment continues and then Will startles up, coughing and spluttering to be wrapped in his mother’s arms once again. Right – Hopper is very audibly counting his compressions in this scene, and as he gives the compressions he tells Joyce that she will be giving 2 breaths to Will when he is finished. Then you hear him count to 30 and he then instructs Joyce to give the breaths. This is 100% correct! For every 30 compressions, two breaths are given with a slight pause in between to ensure the breath goes in. Well done Hopper! Dwight Schrute is always trying to make the office a better place, but most times his so-called ‘help’ turns out to be more harmful. In this scene, he fakes a fire in the office by heating up door handles, locking doors, starting a small fire in a garbage can, and sending smoke into the main area. When the staff notices, the office goes into total panic-mode, trying everything they can to escape. Dwight tries to get their attention to inform them of what to do next. When he announces that this was a drill, Stanley has a heart attack and falls to the ground. Michael immediately jumps in to help and continues to shout at him before shoving his wallet in Stanely’s mouth to ensure he doesn’t swallow his tongue. Jim tells him not to and quickly grabs the phone to call 911. Wrong – When Stanley falls over, Michael runs to his side and continues to shout at him and then insists that he will give Stanley a breath. It is clear that Stanley is not coherent, although is still conscious and breathing. Michael should have instead checked his pulse, and shouted for someone to call 911. NOTE: In this scene, CPR was not needed (as correctly identified by Jim) because Stanley was having a heart attack. CPR would not be needed unless Stanley became unconscious and went into a cardiac arrest (in which the heart is beating sporadically and needs to be ‘kicked’ back into a normal rhythm). Those suffering a heart attack do not need CPR, but do require immediate medical attention. Wrong – Although it may be obvious, it is important to note that the safety training drill that Dwight organized was extremely dangerous. Things like this should never be done as it could lead to an actual emergency or, as seen in the show, panic, fear, trauma, and a heart attack! Right – The only correct action that was taken in this scene was Jim grabbing the phone when Stanley collapsed and immediately calling 911. Jack and Kate are running through the jungle when they come across Charlie who has been blindfolded and hung off of a tree. Jack instantly runs to hold up Charlie’s feet while Kate attempts to cut him down. Once they manage to cut Charlie down and get him on the ground, Jack (also a doctor) checks his vitals and notices that he is not breathing. He adjusts Charlie’s head to ensure that air will go in and then gives him two breaths. Jack then begins giving compressions – he gives about 15 and then returns to give Charlie another two breaths. Kate starts to accept that Charlie is gone but Jack refuses to give up. After another handful of compressions, he begins to beat at Charlies chest and Kate has to walk away, overwhelmed with emotion. When she gets ahold of herself she goes back to Jack who is still pounding Charlie’s chest. She tries to pull Jack away telling him that Charlie is gone, and Jack hesitates for a moment and stares at Charlie’s seemingly lifeless body. But then Jack decides he does not want to stop and begins hitting Charlie’s chest even harder. Then Charlie gasps for air, coming back to consciousness to a rejoicing Jack and Kate. Right/Wrong – Jack was correct in giving Charlie two breaths between compressions. This being said, 30 compressions should be done between every 2 breaths – which was not the case for this scene. Wrong – Once Jack is pulled away by Kate, he sits there for a few moments before jumping back into compressions once again. There is nothing wrong with doing only compressions, but in this case, the amount of time between Charlie found hanging and Jack re-starting his compressions is much too long for a realistic chance of Charlie awakening later on. Every minute without oxygen to the brain reduces the survival rate 7-10%. Don’t stop! Keep going! Wrong – Something else that Jack did incorrect was the pace of the compressions. You can see at the beginning when he is using the proper form (both hands pressing down on the chest), that he is going much too slow. Compressions should be given at a rate of 100 to 120 per minute – or to the speed of “Staying Alive” by the Bee Gees. Rory has been released by a Siren and into Amy’s care – the Doctor and Amy decide to take Rory off of life support and plan to resuscitate him after they move him back to the Tardis. Once removing life-support, Rory begins to slowly fade. Amy and the Doctor quickly take him back to the Tardis and there, lay him on the ground where Amy begins CPR right away on the unconscious, not-breathing Rory. She gives him one very long breath and then begins compressions. After about four compressions she takes a deep breath in and then gives the air to Rory. She continues this pattern but begins to doubt her ability of bringing him back. The Doctor encourages her to keep going and tells her that she can do this, she can save him. Amy continues giving CPR and begs the unconscious Rory to wake up. Finally, she gives one last breath and then begins to cry over Rory’s body. The scene pans to the Doctor’s face which clearly shows the hopelessness of the situation. As she is crying and the Doctor is consoling her, Rory suddenly begins to cough and wakes up. He looks at Amy and says, “you did it” and they embrace before the scene ends. Wrong – One of the first things to note is that when Amy gives breaths she takes a huge breath in before giving it to Rory. This is not necessary. You are not trying to give them tons of air, you just want to give them enough to get oxygen into their blood once more. As well, Amy only gives one breath when she should be giving two. Wrong – Another error that Amy made was the number of compressions given. She gives one huge breath and then follows with only 4 compressions before returning to the breaths. 30 compressions should be given between each set of two breaths, as well, compressions should be given deeply and at a steady pace. The Riverdale group is out in the snow-covered woods searching for Cheryl. The group pauses to look around for any signs of her. Suddenly she is spotted across the snow-covered lake. Archie calls out her name and then they see her small figure beating on the ice. They run to her but stop at the edge of the lake noticing that the ice appears weakened. They call out to Cheryl who turns around, clearly upset and crying. They tell her to come back so they can figure things out. Just as they think she may come back to join them, Cheryl collapses through the ice and into the freezing water. They run across the ice and begin to sweep snow away to find her. Archie finally sees her through the ice and begins to pound at it with his fists, bloodying them and breaking them severely. Archie pounds faster and faster until finally he breaks through the ice, reaches down, and brings Cheryl up to the surface. She is unconscious so Archie checks for breathing. Finding that she isn’t breathing, he instantly begins compressions and then gives breaths. Cheryl suddenly spits up water and they carry her back to safety, alive and well once more. Right – One thing that Archie did correctly was to check for breathing. Wrong – Although it is difficult to determine how many compressions and breaths are given to Cheryl, we can tell that he is not giving enough. It appears that he is only giving Cheryl one breath for ever 5 or so compressions. As we know, the correct way to give CPR is to give 2 breaths for every 30 compressions. Although these television shows may need to sign up for some CPR training courses, at least we can learn from their mistakes! Do CPR correctly and you will be giving a person in need the highest chance of survival. Not trained in First Aid or CPR? Register for a course so you have the confidence and skills to jump into action if scenes like this ever happen in real life!